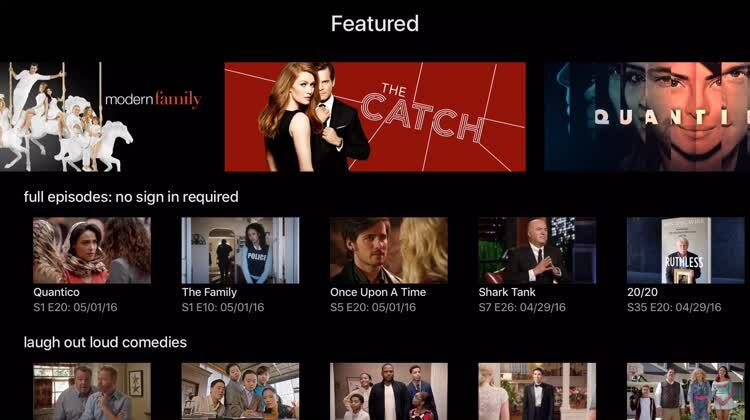 Catch up on all of your favorite ABC shows with the official Apple TV app. Featured, shows, and live TV. WATCH ABC has all of your favorites right at your fingertips. You can browse through the Featured section for something new from family to comedy. If you are looking for a certain show, they are displayed nicely in their own section. Or, take a peek at Live television for what’s on currently as well as what’s coming up later. Whether you have basic television at home or not, the Watch ABC app is the best way to go when it comes to your favorite ABC shows, movies, and news. The Watch ABC app lets you get on-demand episodes from your favorite series, or you can even watch ABC live, without having to have cable. This means that you can catch the late night news or movies when they air on TV. There are also bonus clips for certain shows, in case you want more. Either way, the Watch ABC app is a great way to catch up on your ABC favorites. ABC is one of the old, reliable television stations, and we are happy to be able to watch it whenever we have some time to spare. Whether it's the original programming, news, or movies, the Watch ABC app lets you do it all for free.